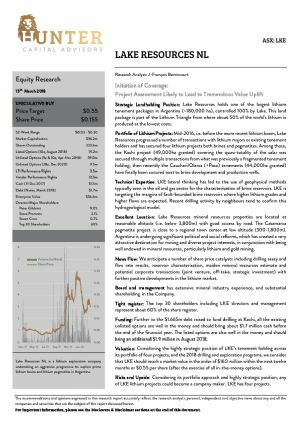 Brisbane, July 27, 2018 AEST (ABN Newswire) - Argentine-focused lithium exploration and project development company Lake Resources N.L. ( ASX:LKE) ("Lake" or "LKE") advises that Lake has entered into an Options Underwriting Agreement ("Agreement") with a group of current shareholders as Joint Underwriters who meet the requirements to perform this service. - Lake has entered into an agreement to underwrite 19,200,000 LKEO options at A$0.10 exercise price for $1.9 million with a group of current shareholders as joint underwriters. 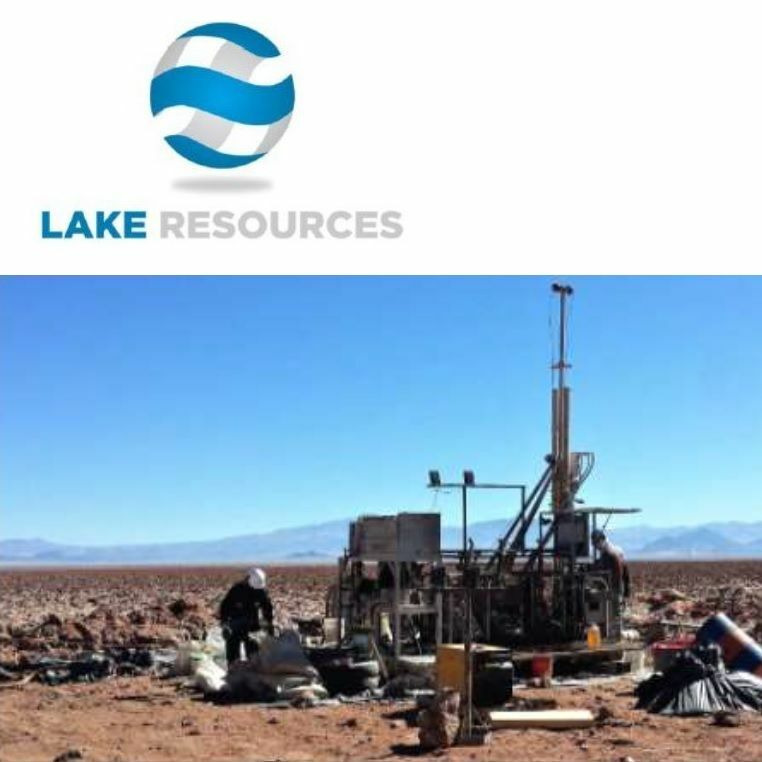 - Successful underwriting of options provides Lake flexibility while drilling is being completed for the maiden resource statement at the large scale Kachi Lithium Brine Project in Argentina, anticipated to be ready in October. 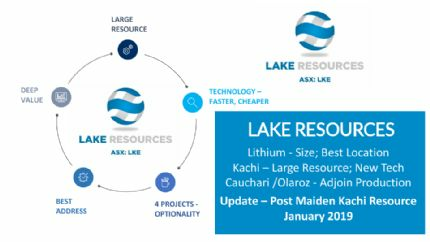 - The Kachi Lithium Brine Project is an exciting maiden discovery of a very large, deep salt lake basin, of similar size to globally significant lithium producers, over 22 x 8 kilometres that hosts a very large lithium brine body from near surface to over 400 metres depth. Under the Agreement, the Joint Underwriters have agreed to underwrite and exercise any shortfall arising from Lake's 19,200,000 listed LKEO options exercisable at $0.10, with an expiry date of 27 August 2018 ("Options Exercise"). The amount underwritten is equal the total amount to be raised from the exercise of the listed options of $1.9 million ("Underwritten Amount") for which the Joint Underwriters will receive a 6% fee. The Agreement includes standard terms and conditions for an agreement of this type including company representations and warranties, and termination of the underwriting agreement by the underwriters in the event Lake's share price falls below the exercise price of $0.10 on a 5 day closing VWAP basis, or the S&P/ASX 200 falls by 10% or more from date of agreement being signed. As part of the Agreement, the Company's Chairman, Mr Stuart Crow, has agreed to participate as a joint underwriter for 3,100,000 LKEO options, entitling him to a 6% fee. Any shares to be issued to Mr Crow under the Agreement will require approval of the Company's shareholders prior to their issue. 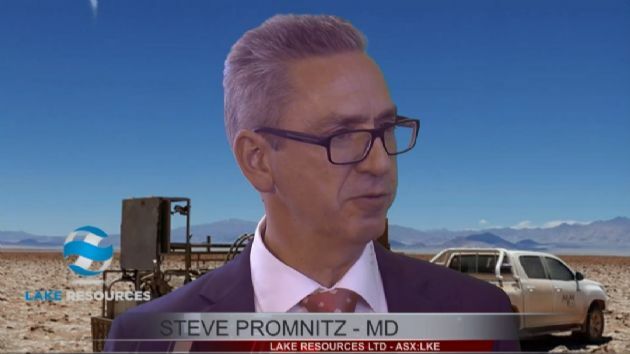 Lake's Managing Director, Steve Promnitz, said: "Lake appreciates the support of the joint underwriters, including the Company's Chairman, as it shows confidence in the development plans of the Company, including the upcoming resource at the large Kachi project and the impending commencement of drilling at Cauchari next to a major and recently expanded lithium brine resource."